Orange County Water District’s (OCWD’s) Philip L. Anthony Water Quality Laboratory is the first public agency laboratory in California to achieve state certification to analyze for per- and polyfluoralkly substances (PFAS) in drinking water. The PFAS family of chemicals includes perfluorooctanoic acid (PFOA) and perfluorooctane sulfonate (PFOS) contaminants. Certification was granted by the Environmental Laboratory Accreditation Program (ELAP) administered by the State Water Resources Control Board (SWRCB). U.S. production of these chemicals by the end of 2015. Although yet to be federally regulated, in 2016, EPA issued a provisional health advisory for lifetime exposure to these compounds set at 70 parts per trillion (ppt) for the combined sum of PFOA and PFOS concentrations. 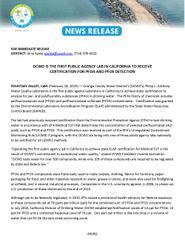 In July 2018, California Division of Drinking Water (DDW) established Notification Levels of 14 ppt for PFOA, 13 ppt for PFOS and a combined Response Level of 70 ppt. One part per trillion is like one drop in a volume of water that can fill 26 Olympic-sized swimming pools. “The Method 537 certification is possible because of significant investments OCWD made to improve the sensitivity of OCWD’s lab equipment to look for contaminants of emerging concern,” stated OCWD Executive Director of Water Quality & Technical Resources Jason Dadakis. The lab is certified and audited by both the SWRCB ELAP and the EPA. 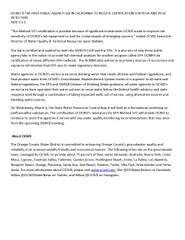 It is also one of only three public agency labs in the nation to provide full chemical analyses for another program called EPA UCMR4 via certification of seven different EPA methods. The UCMR4 data will serve as primary sources of occurrence and exposure information that EPA uses to make regulatory decisions. Water agencies in OCWD's service area serve drinking water that meets all state and federal regulations, and final product water from OCWD’s Groundwater Replenishment System meets or is superior to all state and federal regulations. Per EPA and SWRCB Division of Drinking Water guidance, all water agencies in OCWD’s service area have operated their water systems to serve water below the federal health advisory and state response level through a combination of taking impacted wells out of service, using alternative sources and blending water sources. On Wednesday, March 6, the State Water Resources Control Board will hold an informational workshop on perfluoroalkyl substances. The certification of OCWD’s laboratory for EPA Method 537 will enable OCWD to continue to assist the agencies it serves with any water quality monitoring recommendations that may arise from the upcoming SWRCB meeting. Orange County Water District is committed to enhancing Orange County’s groundwater quality and reliability in an environmentally friendly and economical manner. The following cities rely on the groundwater basin, managed by OCWD, to provide about 75 percent of their water demands: Anaheim, Buena Park, Costa Mesa, Cypress, Fountain Valley, Fullerton, Garden Grove, Huntington Beach, Irvine, La Palma, Los Alamitos, Newport Beach, Orange, Placentia, Santa Ana, Seal Beach, Stanton, Tustin, Villa Park, Westminster and Yorba Linda. For more information about OCWD, please visit www.ocwd.com , like @OCWaterDistrict on Facebook, follow @OCWDWaterNews on Twitter, and follow @OCWD on Instagram.